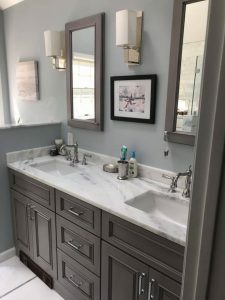 If you are tackling a bathroom renovation, you want to get the most beautiful, functional space you can. Choosing a perfect bathroom sink is critical. What kind of bathroom sink installation will work for you? Consider the five main types of bathroom sink installations. These sinks are easy to install, because they have a sturdy rim that can support their own weight. Essentially, sinks of this type fit into a hole cut in your bathroom countertop. If you plan to reuse your existing cabinetry after your bathroom remodel, this type of sink might be the best option for you. Vessel sinks have gained in popularity over the last few years. These sinks are largely considered to have the most elegant style. Sitting on the top of the counter, these sinks look like a bowl. Also, since they are higher, they are often more convenient to use. What kind of bathroom sink installation will work for you? If you don’t have much space, a wall-mounted sink might be a good option. Since these sinks attach to the wall, they don’t take up valuable floor space. Unlike their wall-mounted cousins, pedestal sinks have a stand that supports them. Since they do not sit on a large cabinet or vanity, though, these sinks are also effective in tight space. If you want to maximize your counterspace and deliver a clean look, you might consider under-mount sinks. These basins sit under your countertop, so you will not have a rim to contend with. With these types of sink installations, you might be wondering what kind of bathroom sink installation will work for you? By working with a skilled remodeling contractor, you can find the best sink for your bathroom project.